I rarely buy soup mixes. However, when the local Hostess Store closed I found these for .89 and they make 4 cups. Today was one of those days when I wanted things to be simple, (and I find myself with no food but stuff to put on it)? You know those days, right? Well, I made this soup, literally as easy as boiling water, and it is amazing. Creamy, tasty and no added salt needed. I put some crackers in mine and one bowl wasn't enough. My highest recommendation for this wonderful product, which you can find in just about any store. Yeah, They are good but you'll never find them for .89 anymore. That definantly was a good bargain. They are between 2.00 and 3.00 most stores. The ones in the stores here are 8 cup versions and cost 3-4 bucks. I got turned on to the smaller bags at the Hostess outlet store 15 years ago. 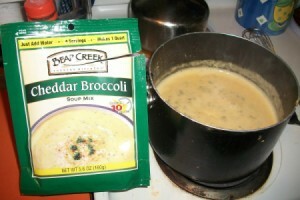 I have had all the cream based soups and find them to be top notch. When sweet corn is in season, I like to add it to the potato soup for a corn chowder. Can highly recommend, Potato Soup, Chili, Minestrone, all are wonderful and I use the Potato Cheese as a base for my white chicken chili. Ours make 8 cups and are good reheated also.